Blue Mug Designs Birth Announcement - Paint the Town! 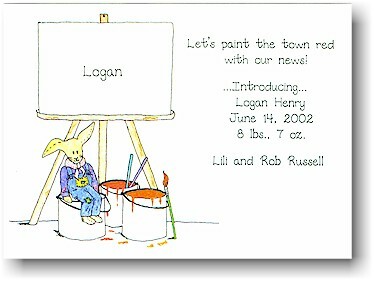 White card with bunny rabbit wearing blue overalls and pink gingham check scarf sitting on a paint can. Specify name to be printed on the easel in the comments section. White flat card with bunny rabbit wearing blue overalls and pink gingham check scarf sitting behind paint cans.